The Majority Journey A10 is an in-car DAB/DAB+ adapter for cars without digital radio. The small device is connected to the existing car radio with a cable or wirelessly via FM. An included windscreen aerial is also connected to the device to enable reception of digital stations. More than 90% of new cars sold in the UK now come with digital radio as standard, but millions of cars and vans do not have a DAB/DAB+ radio. Devices like the Journey A10 make it possible to receive digital radio without replacing the car’s existing stereo. After the adapter has scanned for available stations for the first time they can be browsed by turning the navigation wheel. A station can be selected by pushing in the dial. The station name will be shown with the signal strength on the display. Ten preset buttons are found across the top of the adapter. This makes it easy and potentially safer to change between favourite stations while driving. The brightness of the screen can be adjusted – a useful option if you find that the display is too bright or too dim. 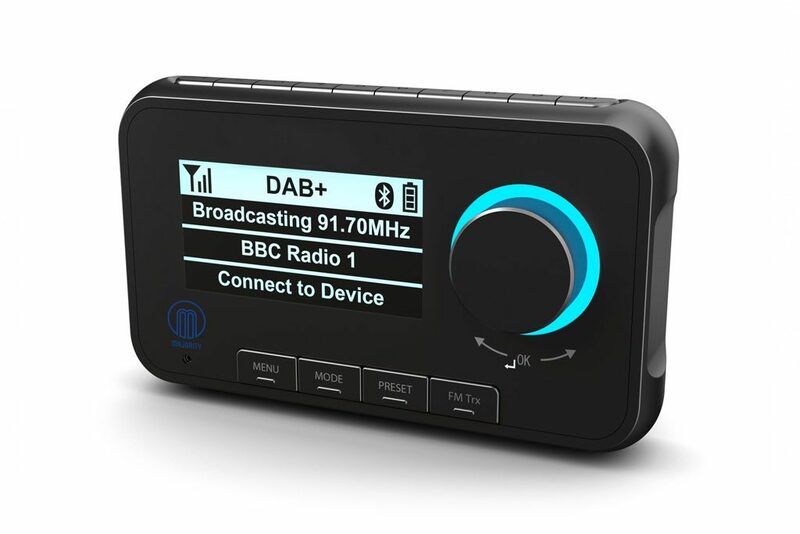 As well as DAB/DAB+ digital radio, the Majority Journey A10 has Bluetooth connectivity. Music or podcasts from a smartphone or tablet can be played through the unit. Handsfree calls can be made and received through the device too. When a smartphone is connected over Bluetooth the contacts will be imported on the device. An aux input means that devices without Bluetooth can be connected and heard through the car speakers. This is ideal if you have an iPod loaded with music, but no aux input in your car. Everything required for the installation is included in the box. A 12V power cable and the antenna are included with the adapter. Clasps for the cables are bundled with the adapter for a secure and tidy set up. Cleaning screen wipes are included to ensure the best adhesion for the windscreen aerial. Most users should be able to install the device themselves, but a car audio specialist or garage would also be able to complete the work. The DAB adapter can be connected to cars with an aux in socket using a 3.5mm lead from the aux out socket. Connecting in this way will provide the best sound quality. For cars without an aux in socket the built-in FM transmitter can be used. A dedicated ‘FM Trx’ button can be pressed to find a free FM frequency. Once the Majority Journey A10 finds an available frequency it will be shown on the display. The car’s built-in radio can then be tuned to this frequency to hear the digital stations. Two types of mounts are also in the box, allowing the adapter to be mounted on the windscreen or an air vent. The mounts unclip from the unit for easy stowing in a glovebox or removal from the car. Verdict: The Majority Journey A10 adds DAB digital radio and Bluetooth streaming to cars with an existing stereo and 12V socket. The unit is easy to install and operate. Everything is included in the box to get started with the adapter.